“We go to strenuous efforts to ensure specification is always of the highest standard, yet appropriate to the specific target market” says Richard Page, sales and marketing director at Spitfire Bespoke Homes. “We carefully select reputable brands which customers recognise as high-quality and reliable; such as Hansgrohe taps, which come as standard in most of our homes, and are known for being stylish, classic and long-lasting. And as a forward-thinking company, we are always looking for new ways to develop our specifications”. The developer has two developments on the market, both of which are designed with great attention to detail. In Windsor, St Mark’s Row comprises 14 new homes which are being built on the site of the former fire station. Here, there will be five townhouses, eight apartments and one penthouse with prices starting from £750,000 for the apartments, £1.25 million for the penthouse and from £1.3 million for the townhouses. Green Gates is a gated development in Maidenhead of four and five-bedroom detached and semi-detached properties. Prices range from £860,000 to £1.375 million. The homes in both developments have bespoke kitchens, Silestone quartz worktops, glass splashbacks and integrated Siemens appliances, bathrooms feature white contemporary sanitary ware by Villeroy & Boch, wall tiling by Porcelanosa and bespoke fully-fitted wardrobes. All owners will benefit from access to off-street parking. John Pope, Octagon’s Bespoke director says, “quality is synonymous with the Octagon name, and every home we work on is finished to the highest of standards and specification – something we know our clients value as a key part of the comprehensive service we offer”. 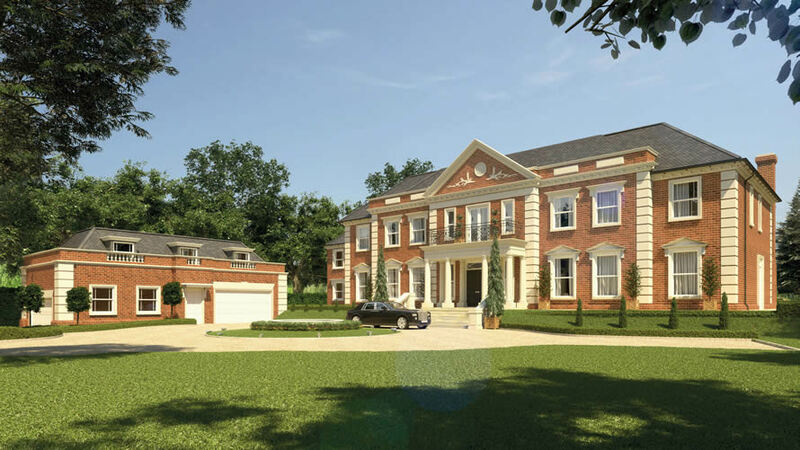 The company is launching Titlarks House in early November, a 16,000 square feet mansion in a 1.6 acre plot in Sunningdale. “This epitomises our reputation for building luxurious ‘superhomes’. Bespoke joinery has been built into the study, bar and TV room while the dining room is given an added sense of luxury with feature wall panels by Phillip Jeffries. With both his ‘n’ hers dressing rooms to the master suite, a custom-made shoe and bag storage unit has also been implemented” says Pope. The house will have five en-suite bedrooms and two staff suites, seven reception rooms including wine room and library and an extensive leisure complex comprising an indoor pool, gym, spa, sauna, steam and treatment room, plus a KNX building management system integrated with Control4, which will manage each room’s mood lighting, underfloor heating temperature, ventilation and cooling systems. Touch screens will be installed in the main communal areas and leisure suite and there will be a choice of high-tech personal security options. Selling agents Knight Frank will be marketing the property with a guide price of £15 million. In Ascot is a Millgate Homes development called Kingswood. The two five-bedroom detached houses and ten three and four-bedroom semi-detached houses have hand painted kitchens with stone worktops and wine chiller, Siemens appliances in the semi-detached houses and in the detached houses a Falcon continental stainless steel range cooker with five burner gas top and Fisher & Paykel freestanding stainless steel fridge/freezer with ice and water facilities. Bathrooms have Villeroy & Boch sanitary ware with Vado taps and there is underfloor heating to the ground and first floors. The properties, which are in 22 acres of secluded grounds surrounded by mature woodland, yet located less than a mile from Ascot High Street, are being sold through Knight Frank with prices starting at £1.175 million. Hidden away in the picturesque Surrey countryside, lies Crest Nicholson’s Longhurst Park. Located on the outskirts of the charming village of Cranleigh in Surrey, the development comprises a selection of two, three, four and five-bedroom homes and is perfect for first time buyers, growing families and downsizers looking for a peaceful yet well-connected lifestyle. Homes at Longhurst Park boast luxury interiors, designed with the needs of modern home owners in mind, with impressive exteriors that blend in with the village’s traditional architecture. Carefully designed interiors provide each home with its own character, while private rear gardens are perfect for enjoying warm summer evenings spent entertaining family and friends. Known as ‘England’s largest village’, Cranleigh is brimming with charm and character. A traditional butcher, fishmonger and farm shop complement the independent eateries and boutique shops located on the local high street, while sports clubs and a leisure centre champion a real sense of community spirit for families to enjoy. The A3 and M25 are within close reach, making Longhurst Park an ideal development for those seeking a balance between town and country lifestyles. Homes at Longhurst Park are available from £424,950 for a two-bedroom home. The Sales and Marketing Suite is open daily between 10am and 5pm (Thursday 11am – 7pm). For more information call 01483 611001 or visit www.crest nicholson.com/longhurstpark. 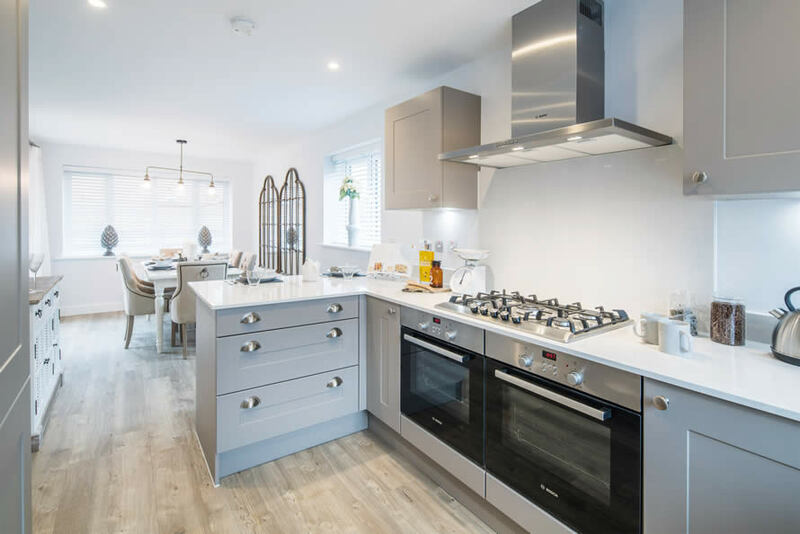 Situated in the charming town of Lower Sunbury in Surrey lies Crest Nicholson’s Park Avenue, a beautiful collection of new homes comprising two-bedroom apartments and three, four and five-bedroom family homes. Homes have been inspired by the grandeur of its sophisticated surroundings, coupled with its natural beauty and rich local heritage, all just a stone’s throw away from Sunbury Park, which overlooks the River Thames. Interiors offer generous natural light and spacious living arrangements, boasting top quality fixtures and fittings including pristine white Roca bathrooms and kitchens fitted with Bosch appliances and Hansgrohe taps. The homes are built using sustainable materials and modern features, from A-rated appliances to efficient central heating systems. Sunbury is located close to the River Thames, with views of the surrounding areas capturing beautiful scenery and royal landmarks, all within touching distance of Park Avenue. The area is also home to Sunbury Cricket Club and Kempton Park Racecourse, which hosts sporting events throughout the year. The development is also conveniently positioned on the doorstep of Sunbury station, and at just a four-minute drive from the development, residents can access London Waterloo in 49 minutes by train. Beyond excellent transport links to central London, the M3 and M25 motorways are also close by, offering immediate access to Greater London, the South West and beyond. Homes at Park Avenue are available from £434,950 for a two-bedroom apartment and £734,950 for a three-bedroom property. The Marketing Suite is open Monday to Friday from 10am – 6pm, Thursday until 7pm, Saturday and Sunday until 5pm. For more information call 01932 505495, or visit www.crest nicholson.com/ developments/park-avenue. Savills’ Sunningdale office is marketing two developments in Windsor. Thameside is a collection of two and three-bedroom apartments built by Shanly Homes overlooking the River Thames. The apartments are finished to a very high standard and have stunning waterside views. The contemporary kitchens are fitted with Miele appliances, there is Villeroy & Boch sanitary ware in the bathrooms, underfloor heating and gated underground parking with heated ramp and electric gate. Prices for the Thameside apartments range from £635,000 to £1.75 million. The second development is Victoria Residences, so named because the building is in Victoria Street. Here, there are two and four-bedroom apartments, duplexes and penthouses, all with a contemporary design with underfloor heating, comfort cooling, secure underground parking and CCTV. Kitchens have Leicht units, Siemens appliances and quartz worktops and there’s a Crestron lighting system and pre-installed speakers. In some apartments, there’s also a stunning bespoke staircase with chandelier lighting. A two-bedroom apartment with study is priced at £695,000 and a two-bedroom penthouse with three bathrooms and roof terrace at £1.25 million. Wellington Grove is a development of 16 luxurious houses by Linden Homes, nestling on the edge of Merrow, near Guildford. Premium specifications include state-of the-art Nobilia kitchens with Silestone worktops, Siemens appliances and wine cooler; luxurious bathrooms with Laufen Pro sanitary ware and Porcelanosa tiling, underfloor heating to all wet rooms, kitchens and open plan kitchen/dining rooms, plus landscaped front and rear gardens. Prices range from £850,000 for a three-bedroom semi-detached, from £1.15 million for a four-bedroom detached and from £1.35 million for a five-bedroom detached house. Retirees are also benefitting from developers upping the spec on their homes for the over 55s. The Farthings in Leatherhead is a Beechcroft development of 35 houses and apartments, which are smart, spacious and energy-efficient. The kitchens include handmade cabinets with stone work surfaces and a full range of integrated Bosch appliances. All properties have gas underfloor heating systems and an electric OptiMyst fire with stone surround in the drawing room. Ceramic flooring is fitted to the kitchen, sunroom and cloakroom in the houses with Amtico flooring to the kitchens and sunrooms in the apartments. Two bedroom apartments start at £495,000 and three bedroom, three-storey houses from £675,000. In Cobham, Beechcroft has another retirement development called White Lion Place – a collection of 30 new and converted houses, apartments and duplexes. These homes have the same specifications except for having Siemens, rather than Bosch, appliances. White Lion Place also has underground parking. In the original Grade II listed White Lion building, there is a two-bedroom house for £750,000 and a two-bedroom apartment for £795,000 with large drawing room, study area and private terrace. Three-bedroom apartments range from £665,000 to £995,000. Individual houses with superbly finished interiors and state-of-the-art fixtures and fittings are also in big demand. “Around the £2 million level, especially in contemporary homes, people expect smart light systems, underfloor heating, branded kitchens and en-suites and integrated appliances with multiple ovens, plate warmers and even steamers. 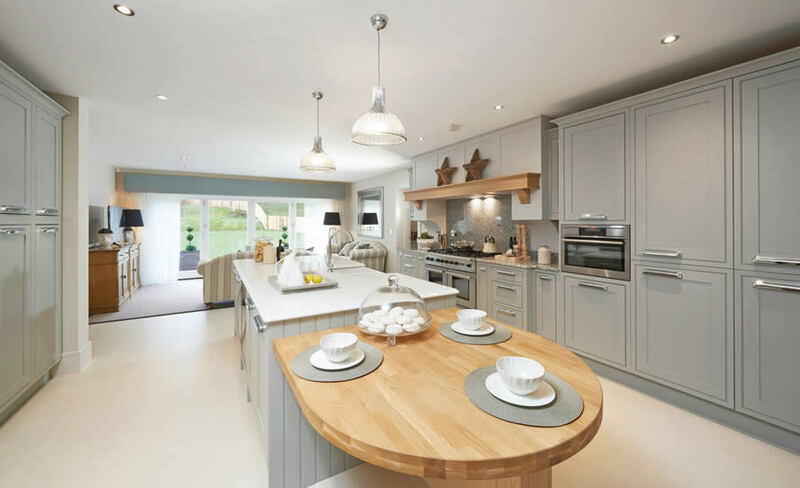 They also like Hydro Taps, which deliver boiling, chilled or sparkling water at the touch of a button and integrated multiple power points” says Tabitha Wale of The Grantley Group, which is selling West House in South Holmwood, near Dorking. This is a fabulous 5,000 square feet contemporary home with open-plan living space, floor-to-ceiling glazing and a dining area opening out onto a large terrace. The five-bedroom, five-bathroom house with a self-contained ground floor annexe has a luxury handmade fitted kitchen with white quartz stone worktops, breakfast bar, two double ovens, American fridge freezer and dual wine coolers; underfloor heating throughout and specialist stone, ironmongery and imported Spanish oak doors which were French polished on site. Sliding electric gates providing access to the driveway and a double garage with electric doors. The house is for sale for £2 million. Mulberry House in Beaconsfield is a three-storey six-bedroom house built by EAB Homes and has a galleried entrance hall, top floor media room with kitchenette and annexe over the double garage. The high spec features include a state-of-the-art Savant Pro home technology network and a Charles Yorke kitchen with Miele appliances – two dishwashers, two ovens, plus a microwave and steam oven, two warming drawers, two fridge/freezers and a Zip Hydro Tap. There is also a larder with a wine cooler and underfloor heating on the ground and first floors. Each en-suite bathroom is individually designed and even the landscaped garden is wired for a summer house. Knight Frank’s Beaconsfield office is selling Mulberry House for £4.75 million.